Jesse French suffers a severe hand injury but still finds a way to stay competitive in the CrossFit Games Open. He has an uncharacteristic way of modifying workouts: he tapes one hand to the skipping rope during Annie. He tapes his left hand to the ring when he does muscle-ups. 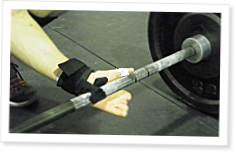 He lifts weights wearing a powerlifting glove with a piece of doweling slapped on the end of it. You might, too, if you were missing four fingers. Twenty-three-year-old Jesse French may be short four fingers, but that didn’t stop him from competing in the Reebok CrossFit Games Open. And not only did he compete, but he also finished in the top 60 and earned a spot at regionals. Not bad considering a year ago at this time French couldn’t work out. He couldn’t even cut his own apple or tie his own shoes. When the final day of the South West Regional began, Matt Hathcock held the last Games spot and suddenly became the man Chris Spealler was chasing. Emily Beers explains. CrossFit Games athlete Marlene Andersson explains how she’s grown to love her adopted Middle Eastern country. It was 93 F at the StubHub Center. Emily Beers explains why human beings are more interesting than elite athletes. I am sprawled on the floor holding my right leg. To find the perfect blend of programming, mentality and diet for an aspiring Games athlete, Emily Beers looks at the approach of four 2011 competitors. Wow, what an inspirational story. Jesse shows the rest of us what it really means to improvise, adapt and overcome, and not let anything get in the way of achieving your goals. I like to write motivational statements on the front page of my training log, and I just added "Well, Jesse did it." Way to go, brother. Nice job Jesse! I love it when doctors say, "you wont", "cant", "never". Yet another story of the strength of the human will and spirit. Good stuff! You are a great personification of the phrase 'find a way forward'. Thanks for sharing.